Ultrasound Tech Salary: How Much Can You Expect to Make? If you are looking for the best pay you can get with an associate's degree, an ultrasound tech salary is at the top of the list. Currently, diagnostic medical sonographers rank third in the best healthcare support jobs, according to U.S. News. This high-demand career path is among the top nine you can get with an associate's degree explains a report published by Monster.com. Ultrasound technicians make very good money for the degree required. So if you're considering the field, you can be assured that the time and money you invest in getting your associate degree are well-spent. Not only will you have an opportunity to help people, but you'll be able to enter the field in two years or less if you have previous experience in a health profession. Also, this is a quickly-growing field with plenty of opportunities for you. The Bureau of Labor Statistics predicts 23 percent job growth in this industry between 2016 and 2026 -- much faster than average for all occupations. What Is the Average Ultrasound Tech Salary? In which states can I make the most money? How does an ultrasound tech salary compare to similar professions? Typically, when one thinks of a diagnostic medical sonographer, they think of pregnancy. They think of the smile on mothers' and fathers' faces as they see their little one kicking around in the womb. But ultrasound technicians have a very important job beyond determining risks associated with pregnancy and taking ultrasound photos for you to show your family gleefully. Sonograms are used to examine breast tissue, to diagnose issues with the brain, muscles, ligaments, the spine, and more. A cardiac sonographer, for example, will produce imaging of a patient's heart which will then be used to diagnose ailments and save lives. But they do even more than that. Ultrasound techs will interact with patients and prepare them for procedures. They will maintain the equipment they need to do their jobs. This is a profession that requires a keen eye. Diagnostic medical sonographers will analyze images so they can recognize anything abnormal and provide that information to the physician treating the patient. They are an essential part of almost any medical team. The median ultrasound tech salary may surprise you. While many entry-level positions pay peanuts, a diagnostic medical sonographer will make decent money right out of the gate. The median starting ultrasound tech salary is around $50,000 per year nationwide. The pay you will earn as a sonographer depends on your level of education and experience. Location, specialty, and other factors also help determine how much you will make. In general, an ultrasound tech salary will pay you good money. Professionals in the top 90 percent make almost $100,000 per year according to the Bureau of Labor Statistics. Those in the 75th percentile make almost $85,000 per year. The median pay for the profession overall is $71,410. Ultrasound tech salaries that are in the 25th and 10th percentiles even pay decent money -- $59,110 and $50,760 annually, respectively. This data is from a report in May 2017, but you should note that the outlook is even better for your future. Wages in the field have steadily risen since at least 2010. This means that the sky's the limit for ultrasound tech salaries. As we previously mentioned, location is a factor in how much you can make as an ultrasound technician. In many states, diagnostic medical sonographers make well above the median of $71,410. In California for instance, the average ultrasound tech salary is $91,700 per year. Ultrasound techs in Hawaii make $90,250. In Washington, D.C., you can make $89,140 on average. In the state Washington, you'll see around $87,440. Oregon is also a high-paying state, where ultrasound techs can pull in $86,140 per year. Ultrasound techs, in general, make more than people working in similar positions. For instance, radiologic technologists' median pay is $60,070 per year. Cardiovascular techs pull in a median wage of $55,270. Medical assistants make around $32,480. Surgical technologists' median pay is $46,310 annually. Compared to a median salary of over $70,000 for ultrasound techs, it makes a lot of sense to consider this field over similar options if money is a major motivator in your decision-making. If you are in high school and want to become an ultrasound tech, you should study anatomy, physiology, physics, and math. Colleges and universities offer both associate's and bachelor's degree programs. 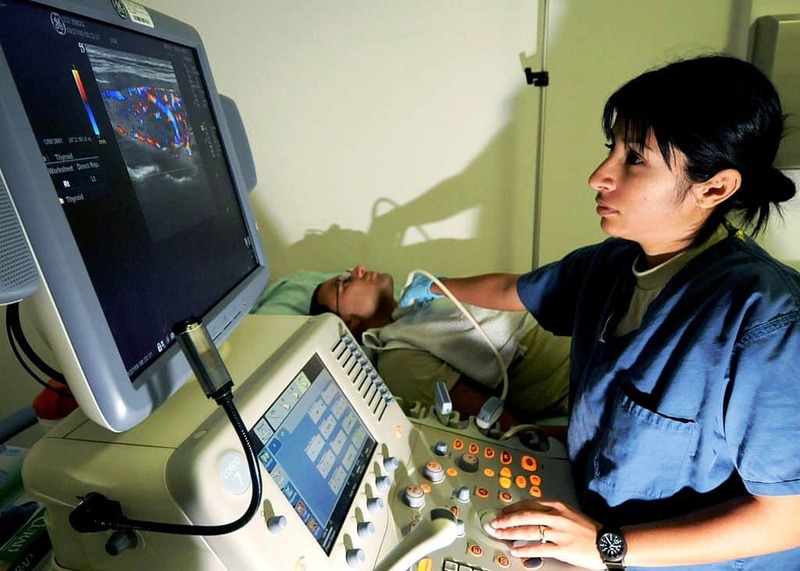 Sonography programs usually include courses in anatomy, medical terminology, and applied sciences. Most sonographers have an associates degree in applied science with a specialization in diagnostic medical sonography. These programs generally include both classroom and laboratory instruction. Most sonography programs are divided into specializations such as breast sonography, neuro sonography, and others. If you're already working in the field, one-year certification programs are also available. Some may choose to pursue a four-year bachelor's degree if they want to go into management or specialize in a more technically advanced field of sonography. You can choose from many specializations as a sonographer. It all comes down to what your passion is. Do you want to help expectant mothers? Is your true passion the human heart? Want to help put someone's mind (or brain) at ease? No matter what part of the human body fascinates you, there's a specialization that will make you happy. When most people think of ultrasound techs, this is the specialization that first pops into their heads. As an obstetric sonographer, you will perform ultrasounds to determine the health of a developing fetus in the womb -- or if there is a fetus there at all. Gynecological sonography generally involves ultrasounds taken of the female reproductive system for reasons typically unrelated to pregnancy. These are used to detect conditions like ovarian cysts, fibroid tumors, pelvic inflammatory disease, and to check the position and presence of an intrauterine contraceptive device (IUD). If you're a caring and compassionate person who wants to help women during one of the most exciting and terrifying times in their lives, this is definitely what you want to be doing. As a neurosonographer, you will perform ultrasounds on the brain and the rest of the nervous system. Your tireless work in neuroimaging will help identify strokes, aneurysms, Alzheimer's disease, brain tumors, epilepsy, spinal stenosis, and more. Neurosonography is also used to discover abnormalities with fetuses in the womb. Ophthalmologic sonographers perform ultrasounds on the eye and eye socket to take measurements before surgeries. They can also help detect tumors, detached retinas, and hemorrhages. This specialty is an opportunity to not only help people see better but to save lives. Breast sonographers play an integral role in the early detection of breast cancer. Unlike mammograms, breast ultrasounds can see all angles and layers of the breast and give a medical team a more clear image of what's going on. Breast sonography is an important tool in the fight against breast cancer -- and you can be a part of it! These are just a few of the specialties you can consider when launching your exciting new career as an ultrasound tech. Others include musculoskeletal sonography, echocardiography, and abdominal and genitourinary sonography. Whatever your passion, you can satisfy it as an ultrasound tech. It doesn't take long to get going. Diagnostic medical sonography is a field that provides you with competitive pay, an opportunity to help people, and a sense of purpose that you won't find with many jobs. If you're thinking about getting your associate's degree and going into a medical profession, there's no reason at all that you should hesitate to consider becoming an ultrasound tech. Featured image: CC0, by Christopher Hubenthal, U.S. Air Force, via Wikimedia.